Khalil El-Mouelhy gives an insight into his views of the awards industry and much more, ahead of the 2016 Gala Ceremony at the Villa Padierna Palace Hotel on October 15th. 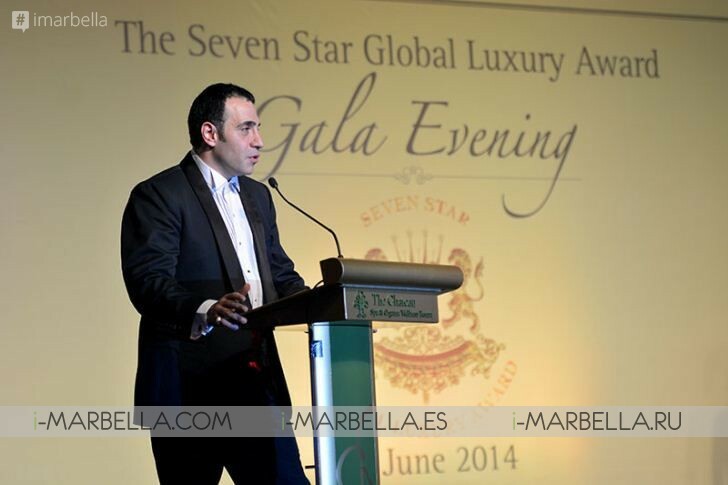 Why did you Create the Seven Stars Luxury Hospitality and Lifestyle Awards? I have been in the awards industry a very long time now and I was able to see the do’s as well as the don’ts. We are at a stage where the “don’ts'” seem to regularly outweigh the “do’s”. I wanted to create an award system which allows the nominated companies to really benefit from the award they receive. What are these do’s and don’ts you are referring to? Well, if I went into extensive detail it would take too much time. In a nutshell, you have to ask yourself the question why do I need an award? The answer to that is 1) to be recognized as the best, 2) to differentiate your property from another property that offers pretty much the same 3) to access new channels of marketing 4) to position your property at the top of a particular market segment. In relation to the Hospitality industry, once the above points are addressed, you have what can easily be considered a wide choice in terms of which awards to participate in. We at SSLHLA work very differently and strive to erase the don’ts…don’ts are all things awards related that you really should be able to do without such as a penalty as paying a fee for being a nominee, paying a fee to use the nomination or winners logo, paying a fee to attend the awards ceremony to collect your award, mandatory marketing initiatives “designed to capture more votes”. Why should you pay to be awarded by an organization which needs you and your property in order to have a good selection of nominations? It makes no sense! Why should you pay to go to a ceremony and collect an award which you have won? Why would a nominee have to buy a marketing package to “get votes” for their property?Do the properties in question not have their own database of clients and partners? No outside company can possibly have more pull or contact with your own clients and partners than you. A magazine advert will not make people say “gosh, I better go online and vote for them now”. Magazine adverts are definitely useful, but not for that particular purpose. How could it be assumed that a database of one of these awards companies, where these so called initiatives are sent to, is so effective and involved that it would provide votes for each and every property that participates? Last time I checked spam laws are pretty strict, this would be considered spam and places the legitimacy and effectiveness of these initiatives in question…all this casts a dark shadow on the awards industry. Why does SSLHLA opt to work in sectors rather than categories? SSLHLA works primarily in sectors because we feel it is more beneficial. If you observe the landscape of the awards industry you will notice certain things. For example, property X in country A wins the “the most amazing luxury Hotel in country A” for lets say 2013. The next year it wins the same award plus “the most amazing city spa in country A Then in 2015 it suddenly wins ” the most amazing conference venue in country A” and nothing else. I have to ask myself, what happend to it being the best city spa or Hotel? Are they no longer the best? Have people changed their mind so drastically? This creates great confusion for the property in question by blurring their identity. We feel that being placed in a sector and winning in a particular sector is far more beneficial and credible, for us as an awards company, and for the winner as well…It avoids confusion and definitely avoids brand dilution. SSLHLA has created a very transparent voting system, can you tell us a little bit about it and why it was created? Indeed, we do have a very effective and beneficial voting system. We want to have as much interaction with our nominees and winners as possible and we, of course, want to provide as much benefit and transparency to them as we can.It is the first of its kind and unique within the hospitality industry! The voting itself has not changed…what we did change is that we allow nominees to log in to our website and view their own personal control panel which enables them to see which country the votes are coming in from, when they are coming in, total amount of current votes ( total amount as well as total current amount from each country), where they stand in their sector at any particular time during the voting. They can log in at any time and as many times as they wish. All requests are authenticated manually in order to ensure that only a real representative of the property in question can see the information. This system also serves as feedback to the property. If a hotel decides to send an email campaign to gather votes to their database, they will be able to monitor the actual response on their dashboard and see from which countries they have received the most responses and which countries would need an elevated level of marketing. SSLHLA does not really use the word travel a lot even though it can be assumed that you are in the travel industry, why is that? We are of course in the travel industry, but because we work strictly in the 5 star segment, without the use of categories, it really becomes a Luxury Hospitality and Lifestyle award since we also work with companies outside the hospitality industry. What do you feel is the most important factor for a hotel to focus on in terms of marketing? Identity…without a doubt, identity! Guests have to be informed of the property’s raison d’etre. This way they will be able to capture their target market and be successful. I think a lot of properties have forgotten about this and they begin to focus on price and generic marketing rather than focusing on building and maintaining identity. It seems that a lot of the time the focus is primarily on short term results rather than on long term long lasting results. Do you think Social Media is effective in helping the hospitality industry? Overall, in terms of getting a property’s name or a group’s name out there, yes, definitely. Social media presents itself as such a cost effective way to market yourself that it has become an absolute necessity. That said, it can also detrimental. Social media has now become a beast that needs constant feeding.Companies are constantly uploading images and captions to get more likes and more followers. I think the objective, in general, has been lost. There is a constant flood of content, but in my view it is more important to focus on content quality rather than quantity. Social Media should be used to help spread, create and maintain an identity as well as to share something that is viewed as interesting and exciting. The 2016 SSLHLA Gala Ceremony will take place at the Villa Padierna Palace Hotel on October 15th, what can guests expect on the night? We are very excited about our return to the Villa Padierna Palace Hotel. It is an extraordinary venue and, 3 months ahead of the event, we are practically full with an exceptional list of attendees. Each segment of the evening will take place in a different area of the property, this adds diversity and excitement for our guests. The evening, as always, will be star studded with the leading lights from the world of luxury Hospitality and Lifestyle. What can the hospitality industry expect in 2017 from the SSLHLA? There will be some big news which we will announce at our Gala Ceremony at the Villa Padierna Palace Hotel on October 15th which will benefit all nominees and winners around the world.